On the day of his packed hometown show at the Midland Theatre in Kansas City, Tech N9ne sat down with HipHopDX.com to discuss his new album and gave exclusive perspective into the writing that went into it. 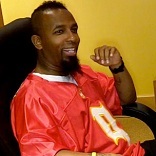 Speaking inside the Strange Music headquarters, Tech laid out the truth behind his arrogant rhyming on “He’s A Mental Giant” and “So Lonely”. He explained that Eminem was originally meant to appear on “So Lonely”, but due to scheduling could not make it. Instead, Tech sough out Blind Fury for his unmatched lyricism. Opening up about his writing style, Tech assures listeners that there is always more behind his words. “He’s A Mental Giant” was produced by Seven. “So Lonely” was produced by Wyshmaster.